JoEllen Conger is a twin writing team using a contraction of their given names combined with their maiden name. Joyce A Kennedy and Joan C. Powell began writing fiction as a joint effort to have a fun way to spend time together. 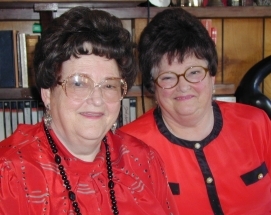 The twins joined Romance Writers of America in 1992. As well as having served as national writing contest judges, each author is also published separately under her married name in cookbooks, newsletters, magazines, short stories, metaphysical self-help books and Oriental self-healing techniques. Joan lives in the picturesque seaside town of Santa Cruz, California while her sister Joyce, lives with her husband in Bakersfield, California in the San Joaquin valley. Although the twins live miles apart, they communicate nearly daily via e-mail. When they're hot on a story, e-mailed chapters fly back and forth several times a day to meld both their ideas together. Both authors adore their feline companions and love sharing computer time with them. Have you ever had an expressive cat help you write? The twin's eyes twinkle with merriment as they erase the extra lettering. The enjoyment of sharing helps to lighten tense moments.